This page allows you to configure windows, dialogs and assistants. Summarize only on mistakes: You may configure Easy2Sync to display a summary of the synchronization only if an error happened. Total summary:This applies if you run several tasks at once. You may configure whether only a total summary should be displayed or summaries for each tasks. Messages by action: If this option is activated, Easy2Sync will (if there are any messages) show the synchronization overview. This dialog summarizes all questions in groups and allows you to make decisions for the entire group. Synchronization wizard: If this option is activated, Easy2Sync will (if there are still any messages after synchronization overview dialog) start the synchronization assistant. It will ask for every single file if the recommended action should be executed. Minimize to tray: If you minimize Easy2Sync, you may toggle whether it should be minimized normally or into the ’Tray’, near the system time. Start minimized: Easy2Sync may be started minimized, for example, you want to start it together with Windows. 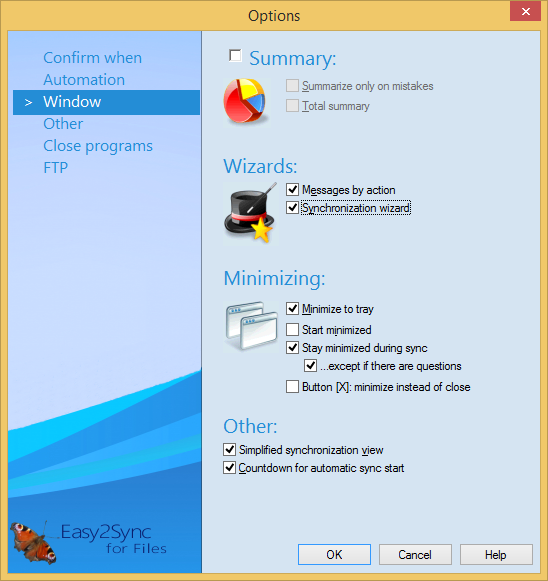 Stay minimized during sync: Prevents Easy2Sync from de-minimized for the sync. ... unless there are questions: Is this disabled, then files / folders that would require your confirmation will be skipped (if Easy2Sync is minimized). Button [X]: minimize instead of close: Changes the X-buttons on the main window to "Minimize". Useful for not ending Easy2Sync by mistake. Simplified synchronization view: Switches the dialog, where synchronization events are listed into a simplified mode. Less buttons will be shown and your commands will be executed directly. Warning when changing application: Easy2Sync can show a warning when you change to another program while synchronizing..